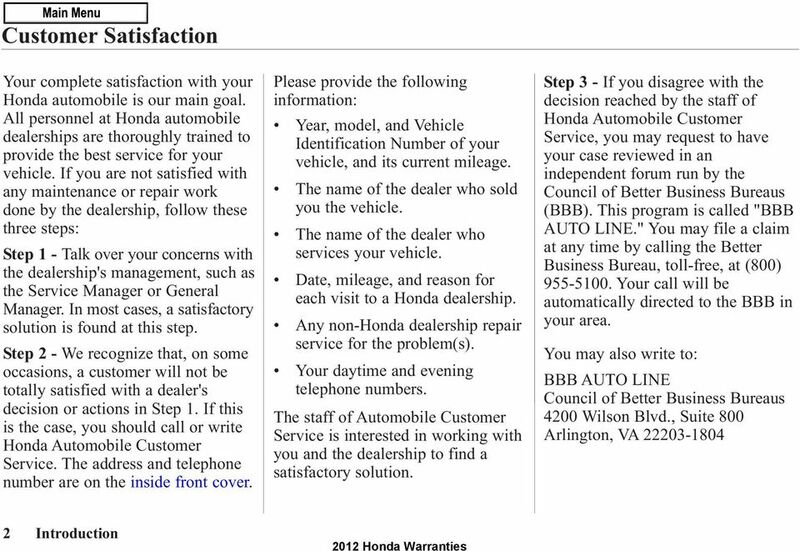 Download "(800) 999-1009 (787) 620-7546"
10 General Warranty Provisions The warranty coverages in this booklet are offered only to the owner of a 2012 Honda automobile. 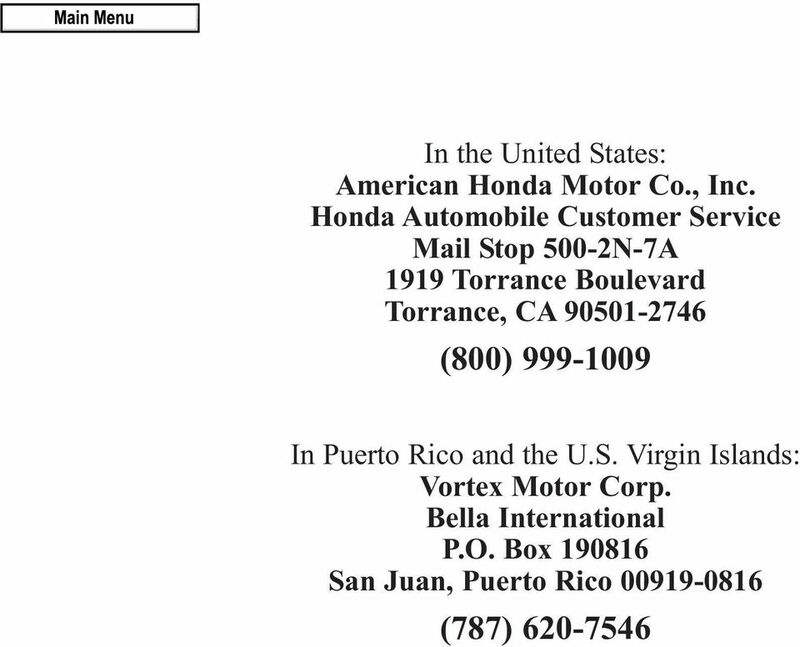 To be covered, the vehicle must be distributed by American Honda through the Honda Automobile Division, and sold by a Honda automobile dealer in the United States, Puerto Rico, the U.S. Virgin Islands, Guam, and the Commonwealth of the Northern Mariana Islands. 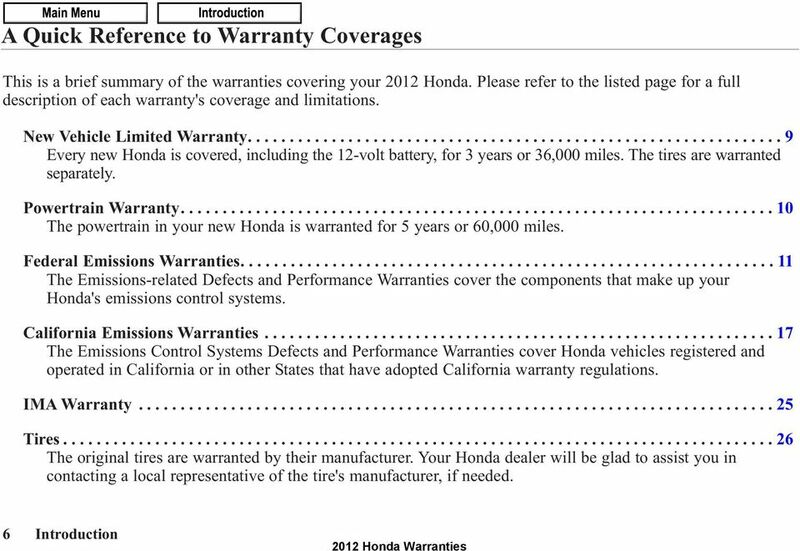 Parts replaced under any of the warranties in this booklet become the property of Honda. Honda will make the final decision whether to repair any existing part or assembly or replace it. 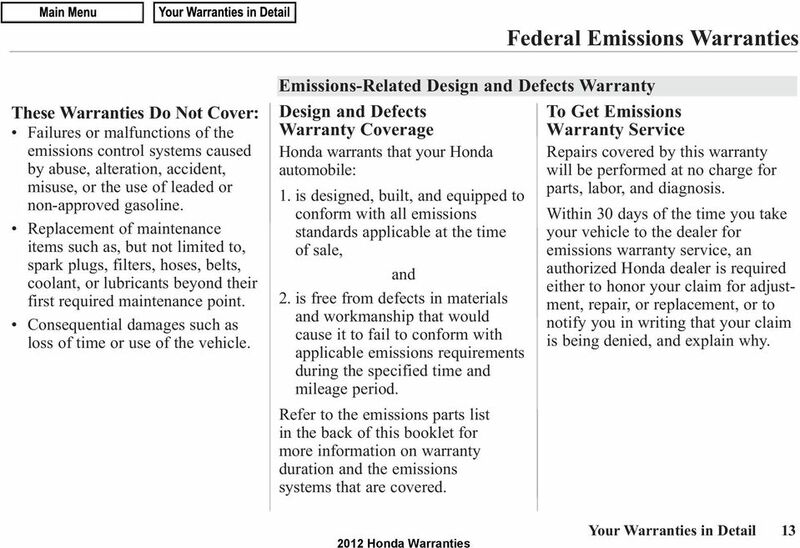 Honda may use factoryremanufactured parts rather than new parts for some warranty repairs. 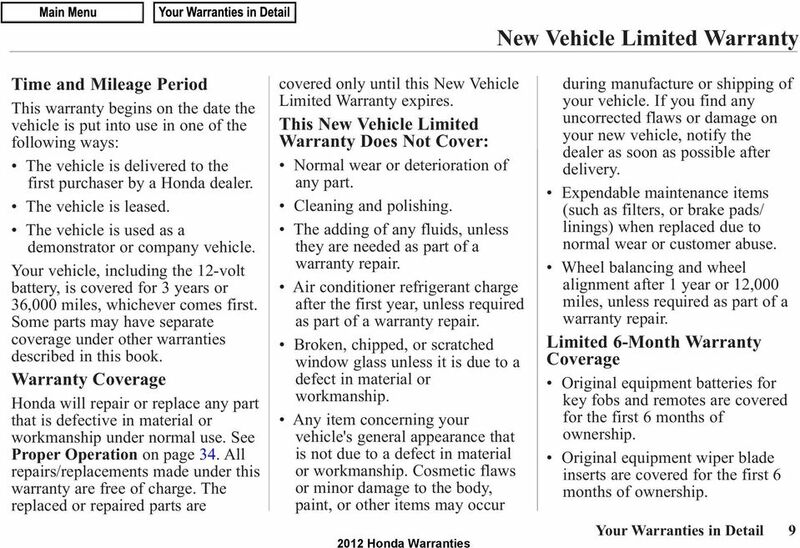 Those parts, like new parts, are covered for the remainder of the New Vehicle 8 Your Warranties in Detail Limited Warranty (see page 9). The warranties in this booklet do not cover: The failure of any part or accessory due to: - Abuse, misuse, accidental damage, or acts of nature. - Improper installation or maintenance. - A low fluid level or the use of a fluid other than specified by Honda. - The installation of any part that is not equal to the original in quality of materials or workmanship. - Use of the vehicle in competition or racing events. Any installed part or accessory that fails because it was not designed to fit that year and model of Honda. Any vehicle with an odometer that has been altered so it is impossible to determine the actual mileage. Any vehicle while it is registered or normally driven outside of the United States, Puerto Rico, the U.S. Virgin Islands, Guam, and the Commonwealth of the Northern Mariana Islands. 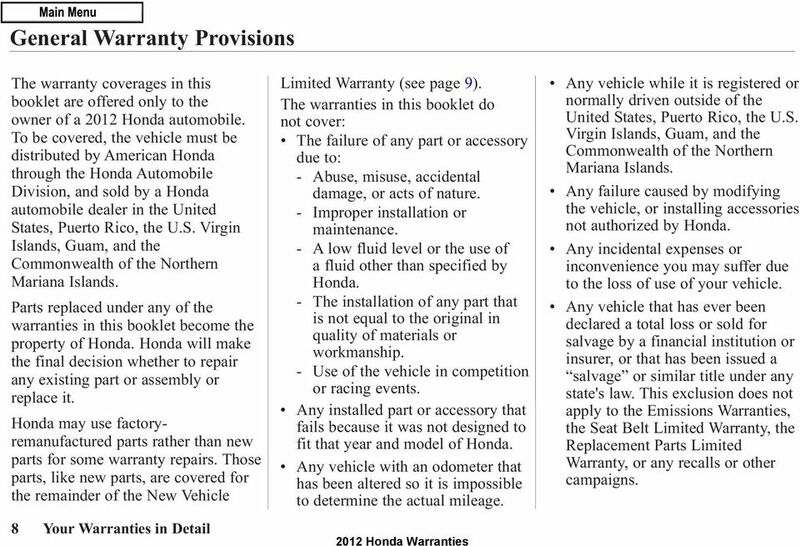 Any failure caused by modifying the vehicle, or installing accessories not authorized by Honda. Any incidental expenses or inconvenience you may suffer due to the loss of use of your vehicle. Any vehicle that has ever been declared a total loss or sold for salvage by a financial institution or insurer, or that has been issued a salvage or similar title under any state's law. 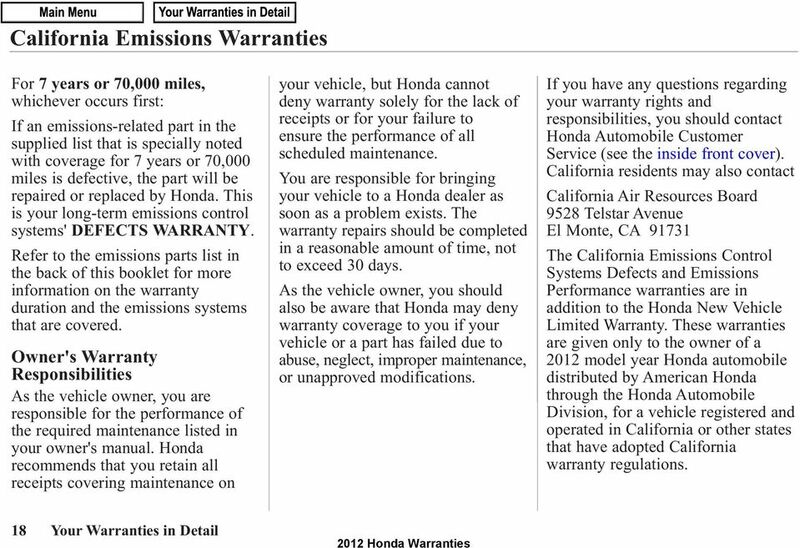 This exclusion does not apply to the Emissions Warranties, the Seat Belt Limited Warranty, the Replacement Parts Limited Warranty, or any recalls or other campaigns. 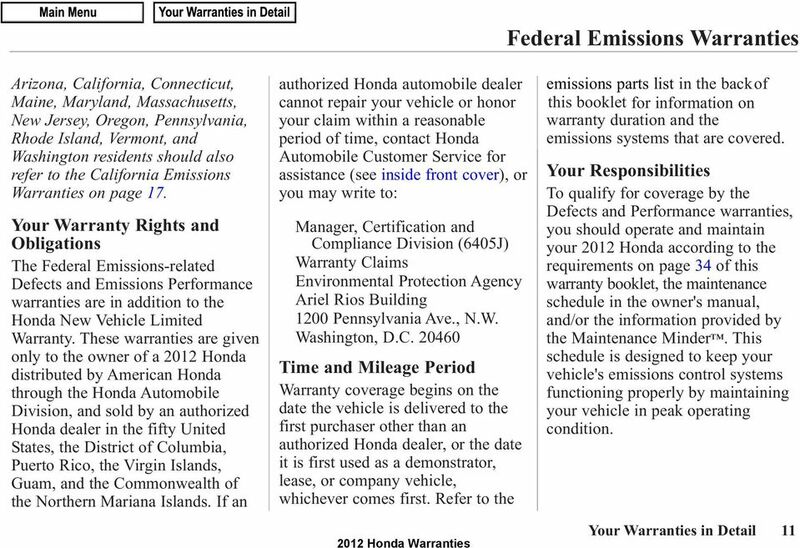 14 Federal Emissions Warranties Honda will not deny a claim for emissions warranty coverage because you did not generally maintain the vehicle, or do not have maintenance records to show that you did. However, any part that fails as a result of your abuse, misuse, unapproved modification, use of improper parts, or failure to perform required maintenance affecting the failed part will not be covered under this warranty. 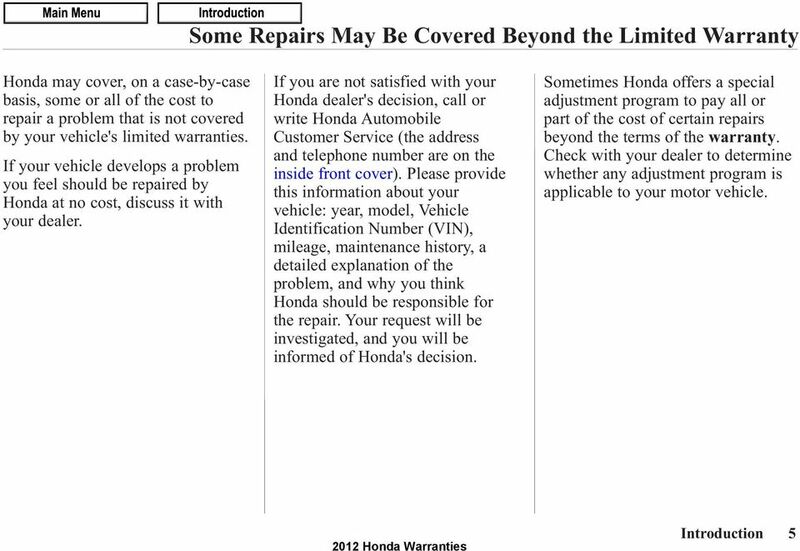 Honda recommends that only parts supplied by Honda or equivalent parts be used to repair your vehicle. Maintenance, replacement, or repair of emissions control devices and systems may be done by any automotive repair establishment or individual. 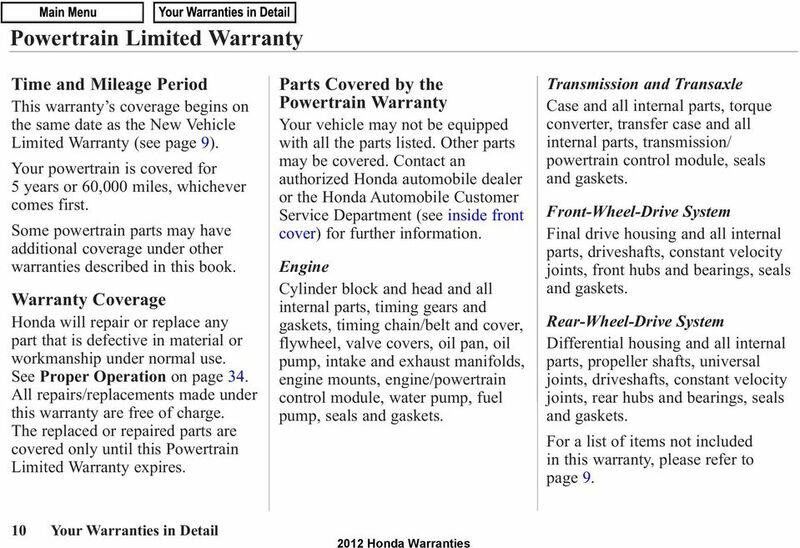 12 Your Warranties in Detail Under normal circumstances, Honda will pay for warranty repairs only when they are performed at an authorized Honda repair facility. However, in an emergency situation, the repair of emissions control devices or systems may be done by any automotive repair establishment or individual, or by the owner, using an equivalent, non-honda replacement part. 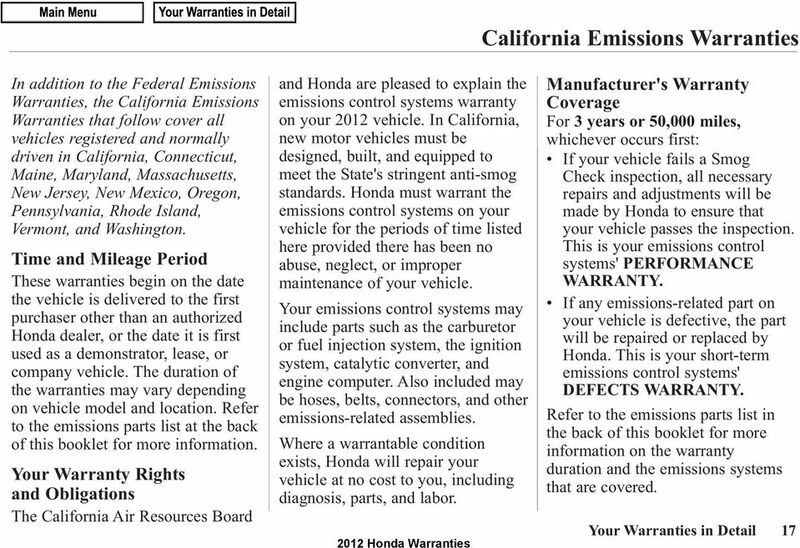 An emergency situation is considered to exist if an authorized Honda repair facility or warranted part is not reasonably available to correct a problem. 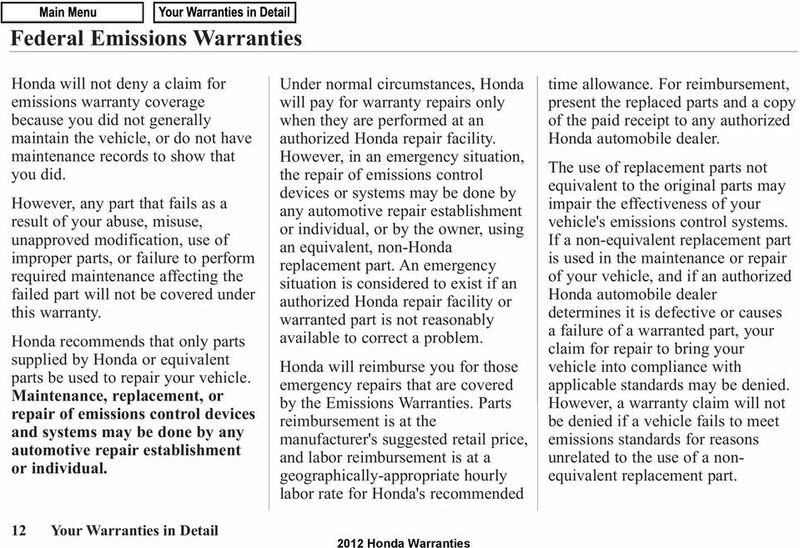 Honda will reimburse you for those emergency repairs that are covered by the Emissions Warranties. 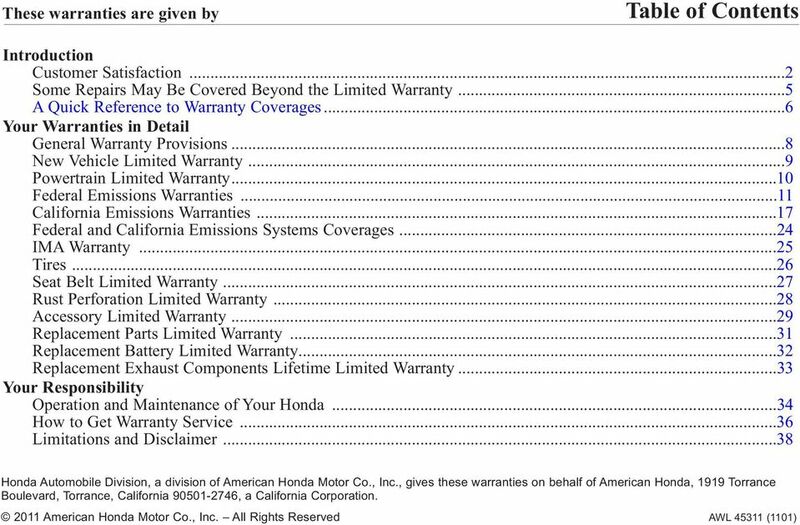 Parts reimbursement is at the manufacturer's suggested retail price, and labor reimbursement is at a geographically-appropriate hourly labor rate for Honda's recommended time allowance. 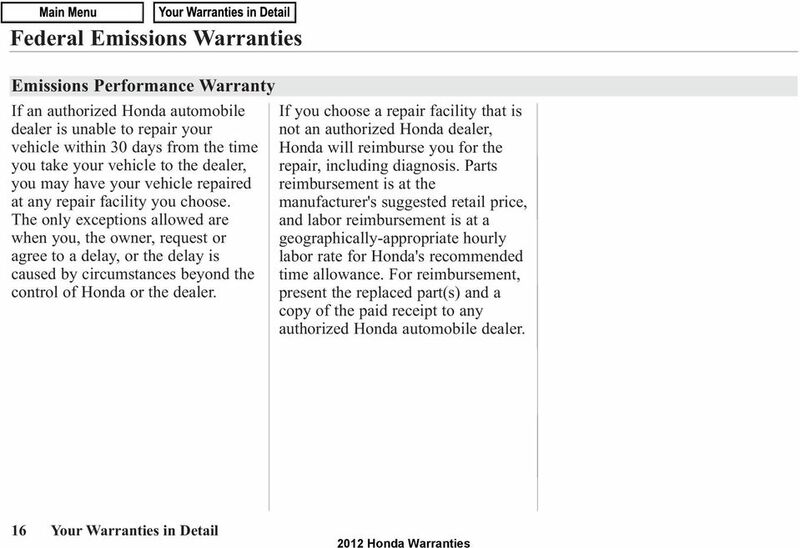 For reimbursement, present the replaced parts and a copy of the paid receipt to any authorized Honda automobile dealer. The use of replacement parts not equivalent to the original parts may impair the effectiveness of your vehicle's emissions control systems. 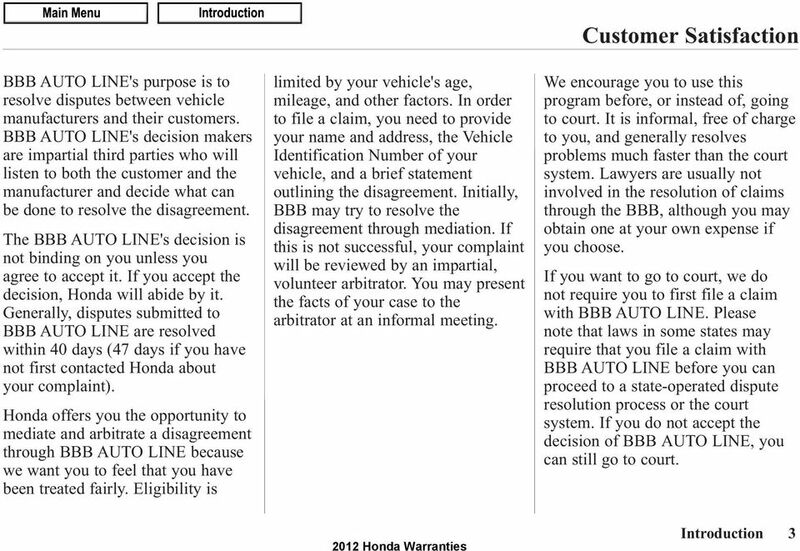 If a non-equivalent replacement part is used in the maintenance or repair of your vehicle, and if an authorized Honda automobile dealer determines it is defective or causes a failure of a warranted part, your claim for repair to bring your vehicle into compliance with applicable standards may be denied. 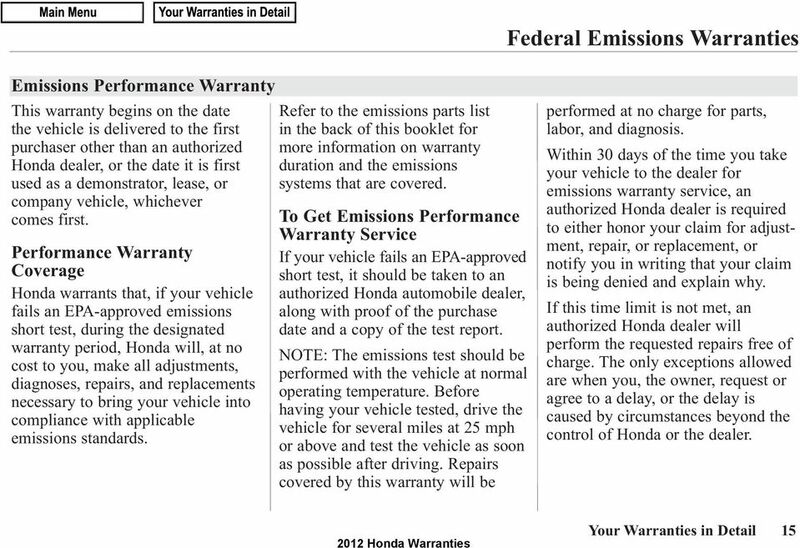 However, a warranty claim will not be denied if a vehicle fails to meet emissions standards for reasons unrelated to the use of a nonequivalent replacement part. 30 Rust Perforation Limited Warranty Only the vehicle s original owner can make a claim under this warranty. Coverage cannot be transferred to any other person or institution (such as an insurance company). Time and Mileage Period This warranty s coverage begins on the same date as the New Vehicle Limited Warranty (see page 9), and continues for 5 years with no mileage limit. Any body panels repaired or replaced under this warranty are covered only for the time remaining in the original 5 years of coverage. 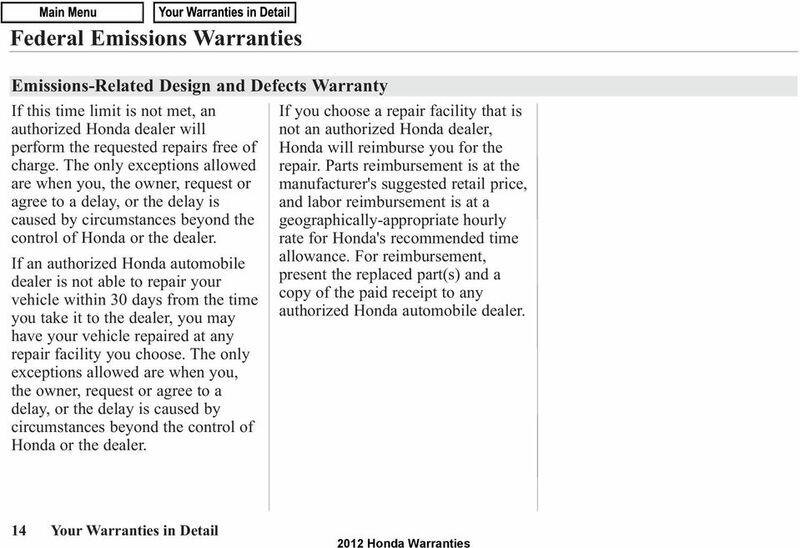 Warranty Coverage Honda will repair or replace any original body panel that rusts completely through from the inside out (perforated by corrosion). 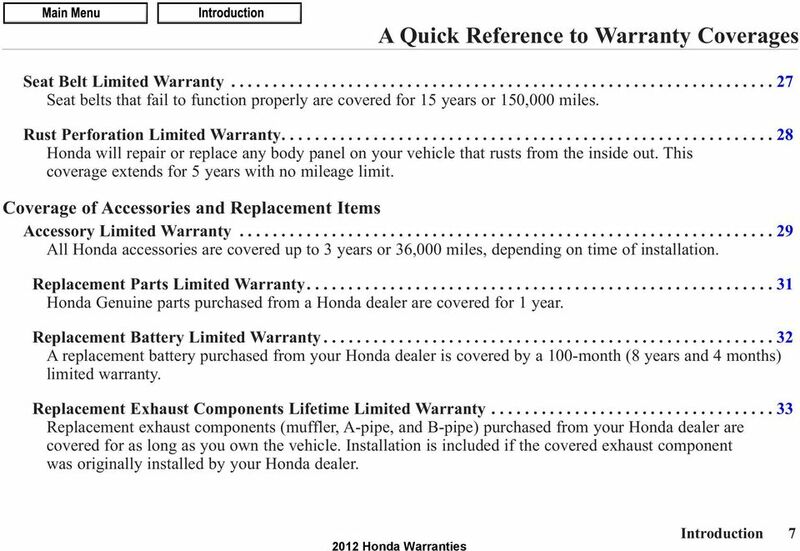 This 28 Your Warranties in Detail includes panels previously repaired or replaced under this warranty. Rust that does not perforate, but is caused by a defect in material or workmanship, is covered under the New Vehicle Limited Warranty. 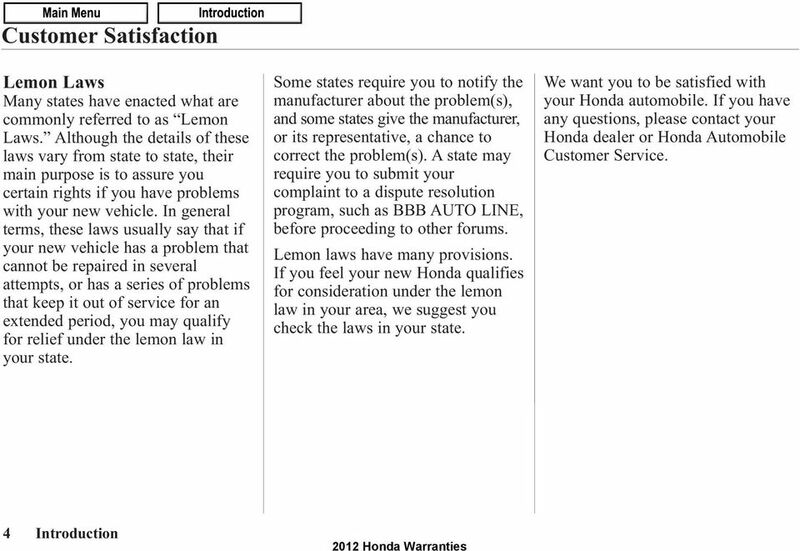 You will not be charged for any parts, material, or labor under this warranty. The decision to repair, rather than replace, any rusted body panel will be made by Honda. This Warranty Does Not Cover: Surface rust on the underbody or any other part of the vehicle except body panels. Rusting of body panels that were repaired, replaced, or refinished after retail sale of the vehicle, unless those panels were repaired or replaced under this warranty. Body panel rust caused by abuse, misuse, or lack of maintenance. Rusting where the paint has been damaged by road hazards such as stones and debris. Rust caused by immersion of the body panel in water, mud, or sand; or resulting from exposure to corrosive gas or industrial fallout. Paint matching. Honda reserves the right to decide how much of the repaired or replaced panel, and any adjoining body panels, need to be repainted to match the original finish. Honda will not, under any circumstances, authorize painting the entire vehicle strictly for the purpose of paint matching.